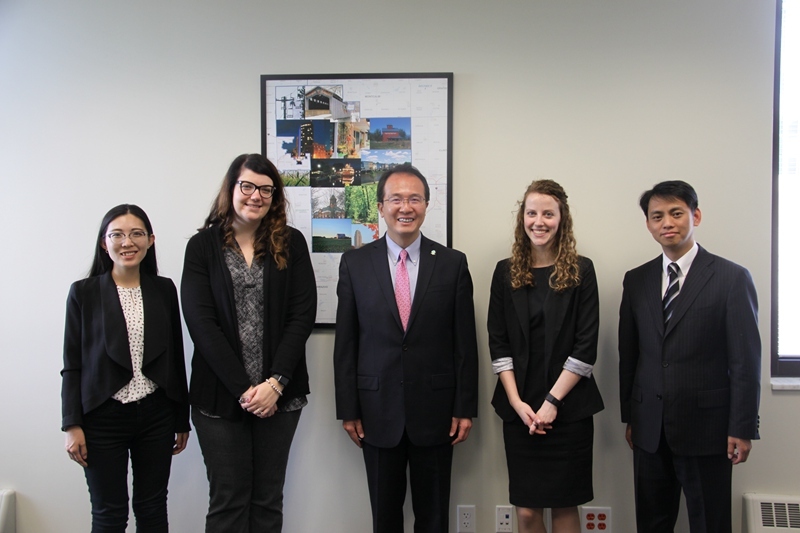 Consul General Hong Lei visited the district office of Congressman Justin Amash of Michigan at Grand Rapids and met with district director Katherine Condon on May 10. Consul General Hong Lei said that in recent years, China and Michigan have enjoyed a strong momentum of development and achieved fruitful results. China is the third largest trade partner and export market of Michigan, with a total trade volume exceeding US $ 12 billion. General Motors, Ford, Chrysler and other Michigan automotive multinational companies are doing a great job in China, occupying an important share of the Chinese market. From 2000 to 2016, Chinese companies invested $ 4.5 billion in Michigan, setting up 123 companies in Michigan and creating more than 10,000 jobs for the local community. With a strong manufacturing industry and high quality labor, Michigan is one of the popular destinations for Chinese enterprises to invest in. People-to-people exchanges have also become a new bright spot for cooperation. At present, more than 11,000 Chinese students are studying in Michigan University. There are four Confucius Institutes and four Confucius Classrooms in Michigan which meet the needs of learning Chinese of more and more American students. Consul General Hong Lei said that the close relationship between China and the state of Michigan fully reflects the characteristics of mutual benefit and win-win between China and the United States. The healthy and stable development of Sino-US relations not only has a bearing on the well-being of the two peoples, but also on world peace and prosperity. Chinese and US heads of state held a successful meeting last month in Florida, pointing out the general direction for the next step in the development of Sino-US relations. China's exchanges and cooperation with the US Midwest will usher in a brighter future. We hope that Congressman Amash will continue to care for and support the development of Sino-US relations and promote the mutually beneficial cooperation between China and the United States. Condon said that the meeting between the two heads of state is very successful and will lead the bilateral relations to move forward. China and Michigan are close partners, and both sides should listen to each other to enhance understanding. Michigan has a strong manufacturing industry and highly educated labor force with broad prospects of cooperation with China. Congressman Amash attaches great importance to US-China relations and supports both sides in carrying out mutually beneficial cooperation and promoting cultural exchanges. The district office is willing to maintain communication with the Chinese Consulate General to promote cooperation and exchanges between the two sides.